Major road infrastructure work is underway in Horokiwi, New Zealand, and Bryce O’Sullivan Contracting Ltd is busy sourcing rock for asphalt at the Horokiwi Quarry with the help of two Terex Trucks TA400 articulated haulers. Located in the North Island of New Zealand, Wellington is marketed as the 'coolest little capital in the world'. Millions of tourists travel there every year to enjoy its art galleries, craft beers and night markets. Set back from the hustle and bustle of the city center is the suburb of Horokiwi. It’s semi-rural, with no schools and only one access road, which comes off the Petone-Wellington motorway. Bryce O’Sullivan Contracting Ltd (BOSCO) has been based in Horokiwi for some time now, helping to renovate the city’s transport infrastructure. It is involved in two of the biggest construction projects in the region – building the Kapiti Expressway and the 27 km (16.8 mi), four-lane Transmission Gully motorway. With the help of two TA400s, BOSCO is shifting blue rock in Horokiwi Quarry, which is being used as base course and asphalt. Since August 2017, the pair of Terex Trucks articulated haulers have removed 200,000 m³ (261,590 yd³) of aggregate and have clocked up around 700 hours. Bryce started his namesake business in 2010, when he was just 16 years old. Over the years, BOSCO has very much become a family affair. His father Suds, who has been in the earthmoving industry for more than 40 years, isn’t the only family employee. Bryce’s partner Becs, her father, and other members of the extended family all play a role within the company. In total, there are 45 employees, six of whom are based at the Horokiwi Quarry. 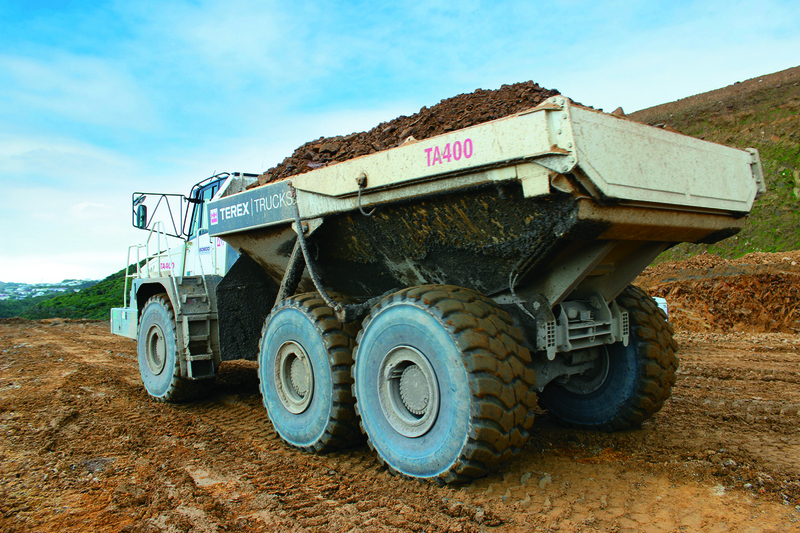 With a maximum payload of 38 tonnes (41.9 tons), the TA400 allows BOSCO to haul serious amounts of rock at Horokiwi Quarry. It has a heaped capacity of 23.3 m³ (30.3 yd³), 331 kW (444 hp) of gross power and a maximum torque of 2,255 Nm (1,663 lbf ft). Together, these performance features make the TA400 the biggest and most powerful articulated hauler on offer from Terex Trucks. Manufactured in Motherwell, Scotland, this heavyweight hauler has been designed to work in heavy-duty applications under extreme conditions. The planetary gear transmission provides smooth, efficient gear shifting for optimized fuel consumption and reduced cost of operation. Ground level test points and a fully tilting cab, combined with an electronically raised hood, ensure ease of service and reduced downtime.